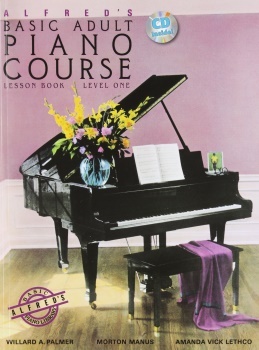 More than 3-million adult students have learned to play the piano using this well-sequenced course. Perfect for beginners who prefer a chord approach, students learn how to play chords in either hand in order to move beyond simply playing single note melodies. This course is most effective when used under the direction of a piano teacher or experienced musician. Titles: Alouette * Alpine Melody * Amazing Grace * At Last * Au Claire de la Lune * Aura Lee * The Ballad of Gilligan's Island * Beautiful Brown Eyes * Blow the Man Down! * Brother John * CafÃ© Vienna * The Can-Can * Chiapanecas * Cockles and Mussels * The Cuckoo * The Donkey * The Entertainer * A Friend Like You * The Gift to Be Simple * Go Down, Moses * Good King Wenceslas * Good Morning to You! * Got Those Blues * Greensleeves * Happy Birthday to You! * Harp Song * Have Yourself a Merry Little Christmas * Here's a Happy Song! * He's Got the Whole World in His Hands * Jericho * Jingle Bells * Joy to the World! * Kum-ba-yah! * Largo (Dvorak) * Laura * Lavender's Blue * Little Brown Jug * London Bridge * Lone Star Waltz * Love Somebody * The Marine's Hymn * Mary Ann * Merrily We Roll Along * Mexican Hat Dance * Michael, Row the Boat Ashore * Money Can't Buy Everything * My Fifth * Ode to Joy * On Top of Old Smoky * O Sole Mio * Over the Rainbow * Raisins and Almonds * Rockets * Rockin' Intervals * Rock It Away! * Scarborough Fair * Singin' in the Rain * Standing in the Need of Prayer * Tisket, a Tasket * Waltz Time * What Can I Share * When the Saints Go Marching In * Why Am I Blue?